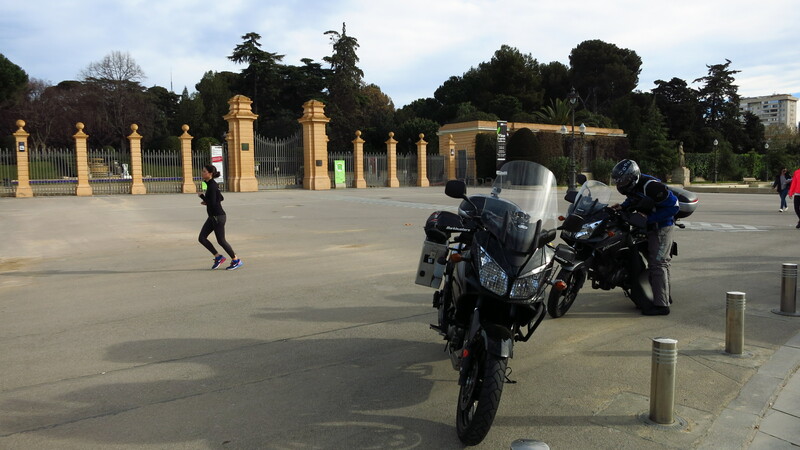 It was 8 am on Saturday morning and loading the bike was taking longer than expected… Besides my stuff I had to carry Nat’s riding suit, boots and helmet, and I had also decided to take my camping gear just in case, as I had not booked hotels or hostels for every single night. My bike sleeps in the street, by the main entrance to my building, so I could not put everything on it the night before and just get up and ride away. By the time I was done, I was already late to meet my riding mate for the day. A friend of mine had recently bought a V-Strom and we had talked about doing something together for Easter, but he only had four days off, so I suggested riding together on the first day all the way to a house my family owns south of Teruel, and then he could ride back to Barcelona and I would go on to Hervás, on the other side of Sierra de Gredos. We arranged to meet at 8 o’clock and I got to the meeting point about 20 minutes late… to find that he was not there! I checked my mobile and saw that he had called me and sent a text: he had forgotten some parts of his new GoPro camera and had gone back home to get them. I had also just got a GoPro for my birthday, and unlike the one that was stolen on the big trip, this one came with a WiFi remote that I had mounted on the handlebars so I could record while riding without having to reach for the camera and risk crashing, and I was looking forward to trying it on this trip, so I could hardly blame him for going back to get his. In the end we set off at about nine, a bit later than expected, but no big deal, we had a place to sleep that night and the whole day ahead of us. I have to say that I had been a bit overoptimistic in planning the route, and the initial idea of riding only secondary roads all the way down seemed a bit too much now, especially since I was not riding on my own and we would be stopping quite often to test the cameras, so we decided to skip the bit that was closest to Barcelona (we could do those roads any other weekend) and take the coast motorway to get to the interesting bits faster. Oh, did I regret that decision… Not only was the motorway tremendously boring, but on that particular day it was also very windy, and we had a couple of scares when sudden gusts of wind almost blew us off the bikes. We made it to Reus in the end, and from there to Flix to start the first interesting bit of road of the day. Past Flix there is a road that goes to the town of Riba-roja, first along the reservoir that carries the same name, and then up the hills where some of the decisive battles of the Spanish civil war were fought. It is a small winding road that nobody takes, and after the long slog of motorway and with the wind already gone, we finally started having fun. Once the road reaches the top of the hills there is a small dirt road to the right that goes to the remains of some tranches built to defend the area during the war. It seems that a lack of coordination and bad intelligence meant they never saw action, even though the fascist troops broke through the lines nearby. The place is well worth a visit, not only to see the trenches but also to admire the views over the reservoir. We took turns to ride in front and record each other, and I was happy to see that my setup was working well. I first tried the camera mounted on the topcase to record myself from the back of the bike, and then I mounted it on the helmet, which I preferred, because it gave me more flexibility to point it different ways. It was on one of the stops to check the cameras, while I was waiting for my friend to change the position of his, that I checked my tank bag and realised that I had taken the wrong keys to the family house. I could not believe it… it was almost lunchtime, and we were too far from Barcelona to even consider turning back. I called my father to see if there was any neighbour that might have a copy of the keys, but there wasn’t. I told Gerard and we decided to keep going anyway and find a place to sleep. More of an adventure. His family is from a small village in the area where we were, called Bot, so he suggested stopping for lunch there, as he knew a good restaurant. While we were having some rather excellent grilled meat we checked some places to stay that night on the mobile phones, but everything was either expensive or already full. In the end we got the address of a backpacker’s hostel in Teruel and decided to stay there. The excellent meal took its toll, and we were feeling a bit heavy back on the motorbikes under the early afternoon sun. 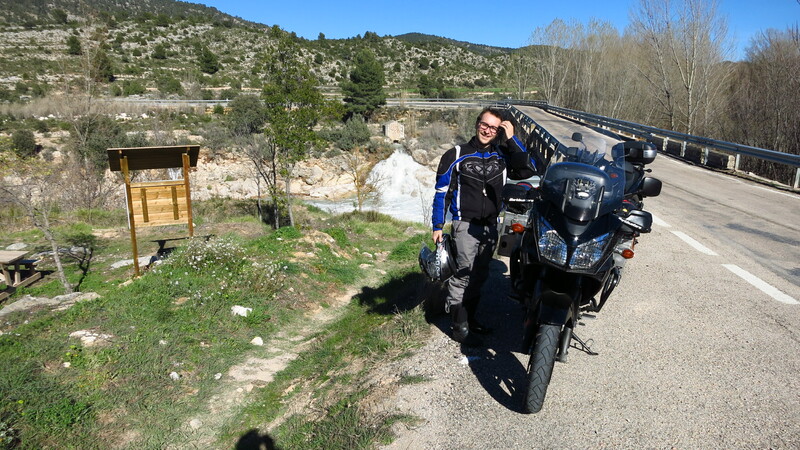 We rode on to the beginning of the Maestrazgo, a mountain range that extends from the south of Catalonia all the way near Teruel, and offers a maze of backroads that wind their way up and down valleys and gorges, and rises to the high plains and passes to offer excellent views. It is a very sparsely populated area, and one can ride for hours without coming across another car, which makes the area a perfect place to enjoy a motorbike to the fullest. After riding to Valderrobres we took a tiny road up the mountain, where we switched bikes. It was an experiment I was very interested in doing, since both bikes were the exact same 2007 model (even down to the colour), but mine had done over 130.000 km and his was barely run in (he got a hell of a deal). I was very happy to see that other than a smoother throttle and clutch action (entirely my fault, I should have changed the cables or at least lubricated them a long time ago), there was virtually no difference. I remembered how many articles I had read praising other bikes “quality” and wondered where that perceived quality would be if I treated one of them like I treat mine. One difference I noticed was how soft the standard suspension was, diving noticeably under braking, when compared to mine, fitted with stiffer Hyperpro springs. Swapping your springs for better ones is definitely money well spent on a V-Strom. We swapped again and rode on to find the consequences of the recent heavy rains that had affected the area all around us. Fields were still flooded, mud had washed over the road in many places, making it tricky to ride around blind corners, and there were rocks on the road at some points. Turning into an even smaller road that had to take us back to a main one, we came across a sign that said that the road was closed. It was only a sign, the road was not physically closed, so we decided to risk it, wanting to avoid a long detour. We took it slowly and after some kilometres we saw the reason – there had been some mudslides that covered half the already narrow road, so a car was unlikely to fit through, only a big 4×4 might have made its way driving with two wheels on the pile of mud. A while later we also saw a small section of road that had been washed away by a stream, leaving only half of it. Back on a bigger road and heading south, I wanted to stop at a place called Santuario de la Balma, a church that had been built under a huge rock. I remember seeing it for the first time on my previous trip in that area, but there were some roadworks in the access and I could not visit it. I feared it would be the same story again because of the rains, but this time it was open. Getting off the bikes at the entrance we almost had a shower under all the water that was dripping off the mountains. Inside church it was even worse – water was seeping through the walls and leaking from the roofs, mostly where the ceiling joined the rock face. I was surprised they had kept the place open. On the way out we stopped to play with the “guard” dog and take some pictures, and off we went again. 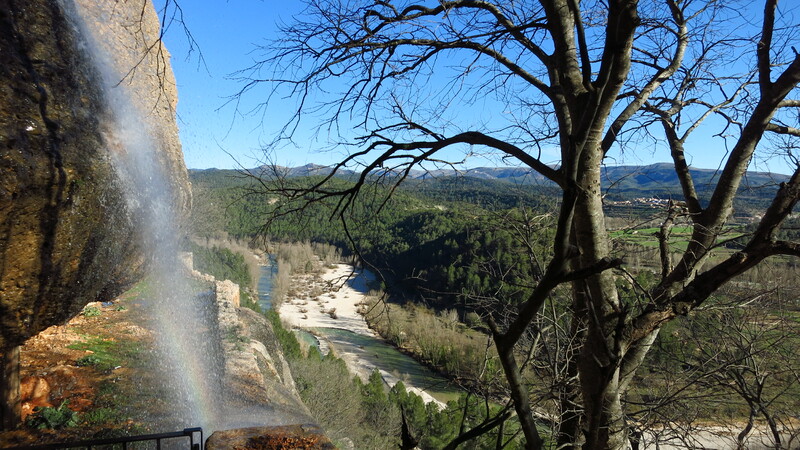 By now it was clear that we were not going to make it to Teruel in daylight, which was a pity, since the last part of the ride through the Maestrazgo offers sensational views of the sunset. We pressed on trying to catch some shots in the dusk light, but shortly after Cantavieja, which is about half way the night caught us. The temperature dropped fast, and at this point we were high enough to see some snow by the road. On a long, fast stretch of road, with me riding first, a couple of dogs walked out of nowhere and onto the road. I braked hard and fortunately they decided not to cross. It was a close shave, the brakes on these bikes are quite a joke and hitting a big dog at speed means a nasty accident. A bit later it was a rabbit and then some goats by the side of the road. By then I had decided that enough was enough, we were still an hour away from Teruel, it was pitch black and there was no point pushing it on the very first day of the trip. Time to find a place to sleep. I thought it would be complicated, as there are only a few villages in the area and they are all very small, but on the second one we came across after me making the decision to stop for the night I saw a sign on the side of the local bar that said they had rooms, and we stopped to ask. The locals looked at us as if we had just landed from another planet, at that time of night and in full motorbike gear, walking into a bar where nobody but the few people who live in the village go. We got a cheap room with two beds for the night and after some deep fried local specialties, a few beers and a gin and tonic we crashed into bed. 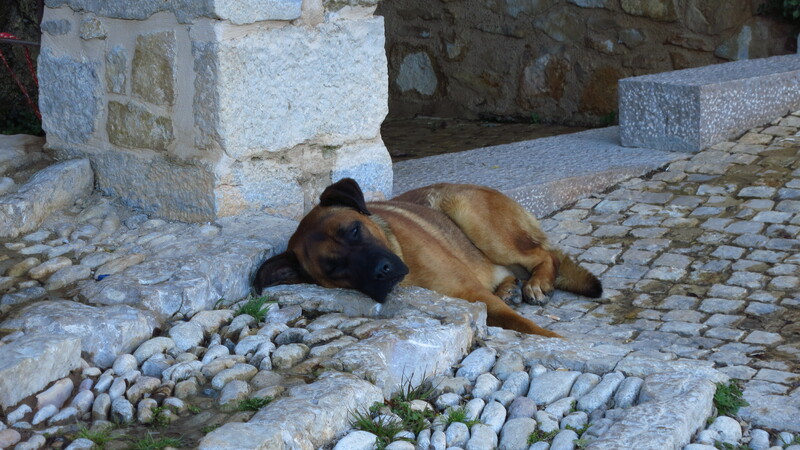 This entry was posted in Portugal and Southern Spain 2015, Travel and tagged Bot, Flix, GoPro, Maestrazgo, Riba-roja, Villaroya de los Pinares by Kilian. Bookmark the permalink.